Update: Sorry, this offer is no longer available! 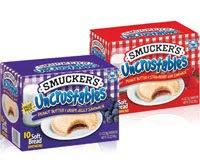 Smuckers is giving away a 4-pack of Smuckers Uncrustables Sandwiches (via coupon by mail) to the first 20,000 people who submit an after-school organization tip. There’s a limit of one coupon per household. Allow 6 weeks for delivery of your coupon. Thanks to Frugal Shopping with Julie for this tip! Julie says that Smuckers will post an announcement when the 20,000 limit has been reached.